Christian Thielemann celebrated his 60th birthday earlier this month and is currently presiding over the Salzburg Easter Festival’s new production of Wagner’s Die Meistersinger von Nürnberg (this deserves a listen as well for Georg Zeppenfeld’s first Hans Sachs). Today, Thielemann is widely regarded as our time’s preeminent master of the Austro-German symphonic ensemble, having garnered well-deserved adulation for his beautifully textured and deeply probing interpretations of works from composers like Bruckner, Beethoven, Wagner, and Strauss. Thielemann’s greatest artistic qualities stem from his ability to unify his exceptional sense for rhythm and orchestral detail with the temporal and dramatic pulse of an orchestral score. Many musical insights emerge so clearly in his performance such that the ensemble gains a living and human dimension. 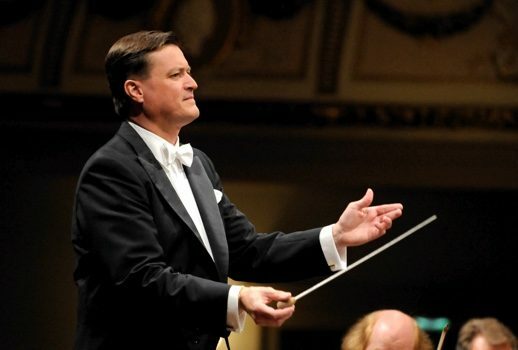 It is no wonder then that Thielemann has conquered so many important milestones over the span of his assiduously crafted conducting career, the most recent of which include his present leadership of the Staatskapelle Dresden, his artistic directorship of the Salzburg Easter Festival, and his specially created music directorship of the Bayreuth Festival. My first encounter with Thielemann’s artistry occurred in a record shop in Hong Kong back in the summer of 2002, long before I became seriously acquainted with opera. At the time, my exposure to classical music had until then been facilitated by old CDs and records of orchestral pieces, largely by famous and famously dead conductors like Herbert von Karajan and Sir Georg Solti. The owner of the store was a knowledgeable British man who often played choice selections from his favorite up-and-coming artists and contemporary musicians. That afternoon, he was playing a CD of Wagner preludes and orchestral excerpts that Thielemann had minted with the Philadelphia Orchestra back in 1998. I purchased two CDs that afternoon—a standard coupling of Beethoven symphonies and a Schumann No. 2 set filled out with selections like the Manfred Overture—little realizing that these records were about to spark my still ongoing admiration for this wonderful conductor’s aesthetics and artistry. What thunder and elan from his Beethoven, what subtle, dreamlike poetry from the Schumann! But if Thielemann’s symphonic recordings initiated me on the process of appreciating his podium alchemy, it was his extraordinary conducting of Strauss and Wagner’s layered and interpretively rich operas that ultimately convinced me of his once in a generation musical intellect. One of the first recordings of opera I’d heard conducted by Thielemann was a broadcast that hailed from Herbert Wernicke’s new production of Die Frau Ohne Schatten at the Metropolitan Opera. Prior to my exposure to Thielemann’s take on this timbrally kaleidoscopic score, I learned of the opera from an old LP of Karl Böhm’s studio recording in my university library. Unlike Elektra (my first Strauss opera), Die Frau Ohne Schatten initially struck me as a fascinating, if architecturally imperfect score—enchanting for its panoply of symbols and motival riches, but structurally episodic and sprawling. For Frosch to be utterly mesmerizing as an opera demands not only the talents of five superlative vocal soloists, but also a gifted conductor who can organize its collection of episodes and exotic orchestral tints into a cohesive whole. Thielemann’s Frau Ohne Schatten was a miraculous experience. Although Strauss’ now hundred-year-old opera has been championed by many legendary artists, only in Thielemann’s reading (and possibly that of Wolfgang Sawallisch) have I encountered a conductor who simultaneously invests the work with a seductively silken Klang while harvesting a battery of musical and dramatic detail from the score. Hofmannsthal’s libretto unfurls in a series of episodes and variegated moods, at times orchestrated densely by the composer. Under Thielemann’s baton, he can caress such lines into a delicately filigreed whisper—transparent in detail, without ever having rhythmic crispness or dramatic tension sacrificed—such that the climaxes that follow truly achieve impact. So certain is Thielemann’s grasp of this score that he can intersperse the characters’ expansive, inward-looking soliloquys with the drama’s propulsively clipped scenes without losing momentum. For those interested in discovering this conductor’s spectacular approach to this opera, I’m including in this article my audio recording of the 2011 production from Salzburg. Even when one considers this opera’s rich and fortunate discography, Thielemann’s Salzburg reading contains some of the most beautifully and artistically rendered selections of the work I’ve heard on disc. I think of the solemn exchange between Barak and the Night Watchmen that closes Act One, here glowing with such nobility. There’s the catalysm that engulfs the ensemble at the second act’s close, where Thielemann, his exceptional cast, and the virtuosic Vienna Philharmonic furnish those final pages with such brilliance and vertical precision. Following that is a heartrending D major theme wherein Barak and his wife express their love for the other, mesmerizing and melting in its ardor. Finally, there is the Amme’s meltdown in the third act, where Vienna’s woodwinds (the entire ensemble is fantastic, but the woodwinds here distinguish themselves with color and responsiveness) dovetail Michaela Schuster’s tour de force performance with such bite and rhythmic vim. All the things I’d spoken of regarding Thielemann’s interpretation of Frau Ohne Schatten can be applied to his individual way with Elektra as well. Of his many Elektras that have been preserved on tape (there is a volcanic one from the late 1990s, where he abets Gwyneth Jones, Helga Dernesch and Nadine Secunde in blowing the roof off the War Memorial Opera, and another explosive one from Covent Garden with Deborah Polaski, Karita Mattila and Felicity Palmer), it is his official Deutsche Grammophon record with the Staatskapelle Dresden (Herlitzius, Meier, Schwanewilms) that captivates my interest the most. Thielemann’s earlier Elektras were cut from a more conventional cloth (if Elektra were labeled a thrilling psychological drama, those early performances carry more of the blockbuster thrill compared with the gradients of subtext he achieves with his current orchestra). With the Dresden concept, he provides an accompaniment that is a shade similar to what Esa-Pekka Salonen conjured within Patrice Chéreau’s subtle, human production. However, Thielemann provides the more richly textured and carefully detailed reading, no doubt aided in great part by the incredibly responsive and virtuosic Dresdeners. I’d like to focus on this recording’s greatest asset—the uncomfortable exchange that occurs between Waltraud Meier’s Klytämnestra and Evelyn Herlitzius’ Elektra. Meier has always presented Klytämnestra as a sympathetic, troubled woman in contrast to the stereotypical caricature of a villainous mother. Here, she and Thielemann achieve something definitive in recreating her unique vision of the character, with every instrumental tint and effect so impeccably placed by the Dresdeners. No discussion of Christian Thielemann’s art would be complete without my mentioning of his superb work in Wagner. Admittedly, my experiences with his recordings of Wagner’s operas were not as consistently positive as those with Strauss, primarily because many aren’t cast with great singers. I remember listening to his Bayreuth Ring from a radio transmission during the summer of 2006, and if I was thrilled as many connoisseurs were by his beautiful and luminous orchestral execution, I also found many of his principals wanting when compared with the legendary singers of the discography. Despite the exemplary conducting, I rarely encountered a Thielemann Wagner recording that presented itself as an unequivocal recommendation. But I was a much younger listener then, and with my maturity I’ve also learned to become more forgiving of less than perfect voices. Upon experiencing that transformation, I was finally able to absorb the genius behind Christian Thielemann’s Wagnerian interpretations. For all the quibbles one can have about the vocalists in Thielemann’s Bayreuth Ring, one can also revel in the dramatically apt pacing, the beautiful orchestral textures, the luminous clarity of sound, and the overarching structural grasp of the tetralogy. If Deborah Voigt and Thomas Moser could not command the vocal security to be an authoritative Tristan and Isolde coupling in his Deutsche Grammophon recording, how powerfully and passionately the orchestra thrums and seethes, particularly in the tragic third act. Great Wagner voices may not be a salient feature of Thielemann’s many recordings, but one can hope that he would one day revisit these masterpieces with artists who are endowed with the vocal luster and the musical insight to match his own. Given his reputation as an aesthetically conservative musician, Thielemann is sometimes perceived as an old-fashioned Wagnerian—weightier, slower, and prone to apply a dense orchestral brush to the score. But those stereotypes completely miss Thielemann’s ability to evolve his understanding of these operas’ chameleonic wealth of instrumental color, dynamics, harmonics, timings (most recently in Bayreuth, Thielemann conducted a sub-10 minute Tristan prelude that never sounds rushed, and wraps up Parsifal in under 4 hours), and texture. Thielemann writes in his book on Wagner that the conductor must consult with the many strands of interpretation that preceded them to better understand the richly layered complexities of these scores. On surveying the chronology of the conductor’s Wagnerian recordings and his orchestral style in detail, one notices a confluence of aesthetic qualities in his work that echo the ideas of Clemens Krauss (his fleeting and dramatically apt pacing), Wilhelm Furtwängler (his architectural grasp and epic sweep), Hans Knappertbusch (his penchant for rubato), Rudolf Kempe (his craft as a colorist), and Herbert von Karajan (his chamber like intimacy and his dramatically attuned modulation of the orchestra). Let me use excerpts of Thielemann’s Parsifals to illustrate the evolution of his ideas as a Wagnerian conductor. The three excerpts of the Good Friday Spell I’ve included here hail from 1998 (Deutsche Oper Berlin with Gosta Winbergh and Matti Salminen), 2006 (Vienna with Placido Domingo and Franz-Josef Selig, DG), and 2013 (Salzburg with Johan Botha and Stephen Milling). The earliest recording of the Karfreitagszauber shows a Thielemann that still adhered to a richer, more Romantic mould, colored with darker textures that vaguely resemble Karajan’s studio recording from 1981. In 2006, the conductor coaxes a more luminous balance from the Viennese that begins to resemble the floating aural tapestry Knappertsbusch was able to exact from the Bayreuth forces during his last years. Unlike the Berlin recording, Thielemann indulges fewer protracted phrases and modulates the orchestra with carefully calibrated approaches to the climaxes. Ultimately, this special presentation offers a most musically rewarding interpretation that overwhelms. I recall shedding a tear on hearing Stephen Milling’s benediction and the extraordinarily powerful buildup toward the crescendo produced by Thielemann and the Staatskapelle Dresden. Before I close, I’d like to leave behind some links to two orchestral concerts that feature composers who are normally not associated with the conductor’s perceived Teutonic proclivities. Both can be viewed with a subscription on the Berlin Philarmonic Digital Concert Hall. The first is a French concert featuring Fauré’s Requiem and shorter pieces by Debussy and Chausson, whereas the other contains Verdi’s Quattro Pezzi Sacri and ballet music from Macbeth, Don Carlos and Otello. I encourage you to explore these videos if you are interested in discovering more of Thielemann’s work outside of the Romantic Austro-German canon. Happy (belated) 60thbirthday Christian Thielemann! Thank you for your generosity with your musical gifts and insights, and may we be blessed with many more years of your extraordinary symphonic and operatic interpretations. It will no doubt be a privilege to finally experience your artistry live when I see your Die Frau Ohne Schatten this summer.